Spleen tyrosine kinase (Syk) is a key regulator of cell signaling induced by cytokines or Fc receptor engagement. However, the role of Syk in rheumatoid arthritis (RA) is not known yet. We investigated the pathways activated by Syk in tumor necrosis factor-α (TNFα)-stimulated fibroblast-like synoviocytes (FLS) using the novel Syk inhibitor N4-(2,2-dimethyl-3-oxo-4H-pyrid[1,4]oxazin-6-yl)-5-fluoro-N2-(3,4,5-trimethoxyphenyl)-2,4-pyrimidinediamine (R406). Using immunohistochemistry, Syk was detected in RA synovial tissue (ST), primarily in the synovial intimal lining. Western blot analysis demonstrated significantly greater amounts of phospho-Syk expression in RA ST compared with osteoarthritis ST. The kinase was expressed and functionally activated by TNFα in FLS and was blocked by R406. 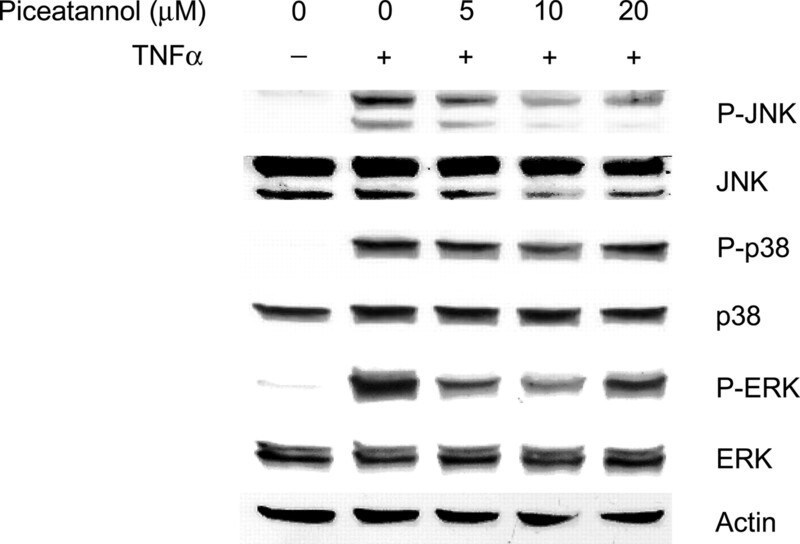 Western blot analysis demonstrated that Syk inhibition by R406 markedly suppressed TNFα-induced c-Jun N-terminal kinase (JNK) phosphorylation in FLS, with a modest decrease in extracellular signal-regulated kinase phosphorylation. Surprisingly, p38 activation was not affected by R406. The Syk inhibitor also decreased TNFα-induced mitogen-activated protein kinase kinase (MKK) 4 phosphorylation but not MKK3 and MKK6 phosphorylation, which is consistent with its selective sparing of p38. 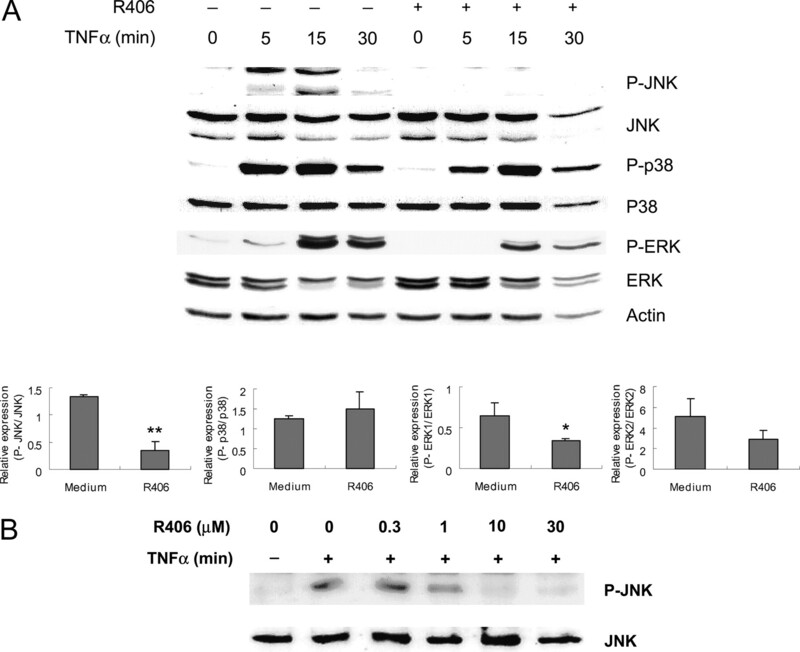 The connection between Syk and JNK was confirmed by demonstrating decreased phospho-c-Jun protein expression and complete inhibition of JNK function in R406-treated cells. R406 also suppressed downstream actions of JNK, as determined by activator protein 1 binding, as well as matrix metalloproteinase 3 gene expression. 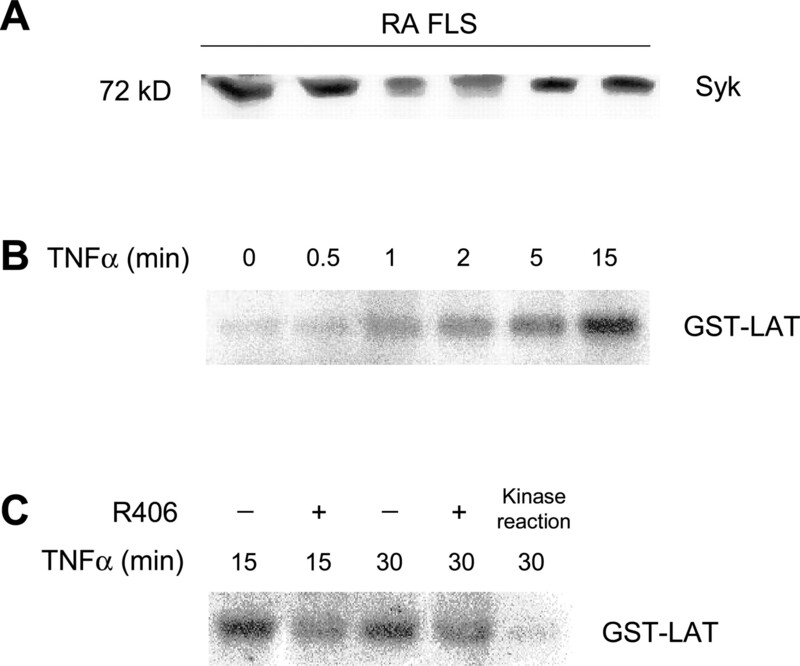 These data demonstrate that Syk activation plays an essential role in TNFα-induced cytokine and matrix metalloproteinase production in RA FLS, especially by suppressing activation of the JNK pathway. Rheumatoid arthritis (RA) is a chronic inflammatory disorder characterized by proliferation of fibroblast-like synoviocytes (FLS) and synovial hyperplasia, resulting in destruction of the bone and cartilage. FLS in RA synovium not only play the central role in matrix degradation by producing enzymes such as collagenase and stromelysin, but they also express proinflammatory cytokines such as interleukin (IL)-6 and IL-8 (Firestein, 2003). Therefore, understanding the intracellular mechanisms that regulate the expression of these genes in FLS could provide insights to the pathogenesis of RA. Transcriptional activation in FLS is mediated by intracellular signal transduction and transcription factor pathways such as mitogen-activated protein kinase (MAPK), activator protein 1 (AP-1), and nuclear factor κB (NF-κB) (Sweeney and Firestein, 2004). Several recent studies have evaluated signal transduction mechanisms in RA FLS responsible for proinflammatory mediator release, especially MAPKs and their regulation by the upstream kinases (Sundarrajan et al., 2003; Hammaker et al., 2004). However, the pathways from surface receptor ligation to activation of MAPKs are only partially understood. Spleen tyrosine kinase (Syk), an intracellular protein tyrosine kinase, is a key mediator of immunoreceptor signaling in a host of inflammatory cells including B cells, mast cells, macrophages, and neutrophils (Wong et al., 2004). Syk is also widely expressed in nonhematopoietic cells like fibroblasts, breast cancer cells, colonic carcinoma cells, hepatocytes, neuronal cells, and vascular endothelial cells (Okamura et al., 1999; Coopman et al., 2000; Tsuchida et al., 2000; Tsujimura et al., 2001; Yamada et al., 2001; Yanagi et al., 2001). Originally, Syk was thought to function primarily in signaling of immunoreceptors such as Fc receptor (FcR) and B cell receptor (BCR). However, recent studies demonstrated the crucial role of Syk in the cell signaling of diverse cellular stimuli including IL-1, tumor necrosis factor-α (TNFα), lipopolysaccharide, and β1-integrin (Yamada et al., 2001; Arndt et al., 2004; Takada and Aggarwal, 2004; Ulanova et al., 2005). For instance, Syk can be activated by TNFα, resulting in MAPK phosphorylation and NF-κB translocation in hematopoietic cell lines (Takada and Aggarwal, 2004). IL-1-induced chemokine production in fibroblasts of nasal polyps is also mediated by Syk activation (Yamada et al., 2001). Syk has emerged as a potential therapeutic target for treatment of allergic and autoimmune disorders. Recently, a Syk kinase inhibitor demonstrated clinical efficacy in a phase II clinical trial in allergic rhinitis (Meltzer et al., 2005). Intranasal administration decreased symptoms of seasonal allergic rhinitis significantly, and the onset of effect was more rapid than intranasal corticosteroids. However, this compound, unlike R406 (see below), is not orally bioavailable and can only be used for topical therapy. R406 is a novel Syk inhibitor that was identified as a potent inhibitor of FcϵR-dependent mast cell activation (EC50 = 43 nM) in primary human mast cells (see Fig. 1). It is an ATP-competitive inhibitor of biochemical Syk activity (Ki = 30 nM). The IC50 for this compound is 41 nM, and it inhibits 78% of Syk activity at a concentration of 0.3 μM. R406 also inhibits the isolated enzymes Lyn (IC50 = 63 nM) and Lck (IC50 = 37 nM). Despite similar IC50 values on isolated kinases, R406 shows selectivity in cell-based assays. In mast cells activated by FcϵRI-crosslinking, the compound is 20-fold more potent for inhibition of linker for activation of T cells (LAT) tyrosine residue Y191 phosphorylation (a Syk kinase substrate; EC50 approximately 0.08 μM) compared with phosphorylation of Syk itself at the Y352 residue (a Lyn substrate; EC50 > 2 μM) (Matsubara et al., 2006). Likewise, cell-based assays demonstrate at least 5-fold selectivity for JAK1/3 (STAT6 phosphorylation in IL-4-stimulated Ramos cells), Lck [extracellular signal-regulated kinase (ERK) phosphorylation in C305-stimulated Jurkat cells], c-Kit (autophosphorylation in stem cell factor-stimulated bone marrow-derived mast cells), Flt3 (autophosphorylation in MV4–11 cells) (Masuda et al., manuscript in preparation). Selectivity of R406 for the phosphorylation pathway activated by Syk has been examined in bone marrow-derived mast cells passively sensitized with anti-ovalbumin IgE (Matsubara et al., 2006). Treatment with R406 inhibited Syk-dependent phosphorylation of ERK1/2, c-Jun N-terminal kinase (JNK)1/2, and ERK5, but not p38. Furthermore, R406 inhibited the release of serotonin and production of cytokines IL-13, TNFα, IL-2, and IL-6 in sensitized cells treated with the inhibitor before cross-linking with allergen, consistent with the reduction of mast cell degranulation and cytokine production in Syk-deficient mice (Zhang and Siraganian, 1999). Chemical structure of R406 salt. Based on recent data implicating Syk in many immune-mediated diseases, we evaluated its expression and function in RA using the novel Syk inhibitor R406. These studies demonstrate that Syk is phosphorylated in RA synovium and is constitutively expressed in cultured synoviocytes. Moreover, Syk is activated in FLS by proinflammatory cytokines such as TNFα and can initiate MAPK cascade. Of the MAPK expressed in FLS, JNK is most closely linked to Syk and can be pharmacologically modulated by R406. Synovial Tissue Samples. Synovial tissue (ST) samples were obtained from patients with osteoarthritis (OA) and RA at the time of joint replacement as described previously (Alvaro-Gracia et al., 1991). Normal ST was provided by Life Sharing (San Diego, CA). The diagnosis of RA conformed to the 1987 revised American College of Rheumatology criteria (Arnett et al., 1988). The samples were either processed for cell culture or snap frozen and stored at –80°C. The studies were approved by the University of California, San Diego, Human Subjects Research Protection Program. Fibroblast-Like Synoviocytes. ST were minced and incubated with 1 mg/ml collagenase in serum-free Dulbecco's modified Eagle's medium (DMEM) (Life Technologies, Grand Island, NY) for 2 h at 37°C, filtered through a nylon mesh, extensively washed, and cultured in DMEM supplemented with 10% fetal calf serum (FCS) (endotoxin content <0.006 ng/ml; Life Technologies), penicillin, streptomycin, and l-glutamine in a humidified 5% CO2 atm. After overnight culture, nonadherent cells were removed. Adherent cells were later trypsinized, split at a 1:3 ratio, and cultured in medium. Synoviocytes were used from passages 3 through 9 in these experiments when they are a homogenous population of FLS (<1% CD11b, <1% phagocytic, and <1% FcγRII-positive). Reagents. Mouse monoclonal anti-Syk antibodies and affinity-purified rabbit polyclonal anti-MAPK kinase (MKK)3, anti-MKK4 antibodies, goat polyclonal anti-MKK6 antibodies, and secondary antibodies were purchased from Santa Cruz Biotechnology (Santa Cruz, CA). Rabbit polyclonal anti-phospho-Syk, anti-phospho-MKK3/6, anti-phospho-MKK4, anti-phospho-p38, anti-p38, anti-phospho-JNK, anti-ERK, anti-phospho-c-Jun antibodies, and mouse monoclonal anti-phospho-ERK antibodies were purchased from Cell Signaling Technology (Beverly, MA). Mouse monoclonal anti-JNK Abs were purchased from BD PharMingen (San Jose, CA). Glutathione S-transferase (GST)-c-Jun and GST-LAT were purchased from Upstate Biotechnology (Lake Placid, NY). Human recombinant TNFα was purchased from R&D Systems (Minneapolis, MN). Syk Inhibitors. The Syk inhibitor R406 was provided by Rigel Pharmaceuticals (San Francisco, CA) (see below). The detailed biochemistry of this molecule will be reported elsewhere (Taylor et al., 2005). Piceatannol was purchased from Sigma (St. Louis, MO). Piceatannol is a selective inhibitor of Syk, especially at concentrations equal or less than 10 μM (Raeder et al., 1999). Immunohistochemistry. Immunohistochemistry was performed as described previously (Elices et al., 1994). Five-micron cryosections of ST were prepared, fixed in ice-cold acetone for 10 min, and incubated with anti-Syk antibodies overnight at 4°C. Isotype-matched antibodies served as negative controls. Endogenous peroxidase was depleted with 0.3% hydrogen peroxide, and sections were then stained with biotinylated secondary antibody (Vector Laboratories, Burlingame, CA). The signal was developed using diaminobenzidine or 3-amino-9-ethylcarbazole, and the sections were counterstained with hematoxylin. Western Blot Analysis. Cells were cultured in DMEM with 10% FCS in 60-mm dishes at 80% confluence. Cells were synchronized in DMEM by culturing in 0.1% FCS 48 h before stimulation. FLS were incubated with medium or R406 (3 μM) for 30 min and then treated with TNFα (50 ng/ml). Cells were washed with phosphate-buffered saline, and protein was extracted using radioimmunoprecipitation assay buffer (50 mM HEPES, 150 mM NaCl, 1% Triton X-100, 10% glycerol, 1 mM MgCl2, 1.5 mM EDTA, pH 8.0, 20 mM β-glycerophosphate, 50 mM NaF, 1 mM Na3VO4, 10 μg/ml aprotonin, 1 μM pepstatin A, and 1 mM phenylmethylsulfonyl fluoride). Frozen ST was pulverized, and tissue protein was extracted in the same manner. The protein concentrations for STs or FLS were determined using the DC protein Assay Kit (Bio-Rad, Hercules, CA). Samples containing 50 μg of protein from cultured FLS or 100 μg of protein from ST were fractionated by 10% SDS-polyacrylamide gel electrophoresis and transferred to nitrocellulose membrane. The membranes were blocked with Tris-buffered saline plus 0.1% Tween 20 and 5% dry milk for 1 h at room temperature, followed by incubation with appropriate antibody at 4°C overnight. The membranes were then washed three times and incubated with horseradish peroxidase-conjugated secondary antibody for 1 h at room temperature. The proteins were visualized by chemiluminescence using Kodak X-AR film (Eastman Kodak, Rochester, NY). Immunoprecipitation and Kinase Assay. To measure the kinase activity of Syk and JNK, FLS (5 × 105 cells/dish) were cultured in DMEM with 0.1% FCS in 60-mm dishes for 48 h and incubated with medium or R406 (3 μM) for 30 min. Cells were then stimulated with TNFα (50 ng/ml) for the different times described below. Cells were washed twice with ice-cold phosphate-buffered saline and lysed in modified radioimmunoprecipitation assay buffer. Lysates were centrifuged at 15,000g for 10 min. Protein concentrations in the supernatant were determined using the DC protein assay kit (Bio-Rad). Then lysates were incubated with 2.5 μg of anti-Syk or anti-JNK monoclonal antibody for 4 h, followed by additional incubation with protein G-Sepharose overnight. The immunoprecipitates were washed three times with immunoprecipitation buffer and once with kinase buffer (50 mM HEPES, pH 7.4, 1 mM MgCl2, 20 mM β-glycerophosphate, 1 mM Na3VO4, 0.2 mM dithiothreitol, 10 μg/ml aprotinin, 1 μM pepstatin A, and 1 mM phenylmethylsulfonyl fluoride) and resuspended in 25 μl of kinase buffer containing 5 mCi of [γ-32P]ATP, 100 mM ATP, and 4 μg of GST-LAT or GST-c-Jun and incubated at 37°C for 30 min. In Syk kinase assays, as a positive control for Syk inhibition, immunoprecipitates were preincubated with Syk inhibitor R406 (3 μM) at 37°C for 30 min. Reactions were stopped by the addition of SDS sample buffer (100 mM Tris, pH 6.8, 2% SDS, 10% glycerol, 5% 2-mercaptoethanol, and 0.25% bromphenol blue). After electrophoresis, the gel was analyzed using NIH Image (version 1.61; National Institutes of Health, Bethesda, MD). Electrophoretic Mobility Shift Assay (EMSA). Confluent RA FLS in 100-mm-diameter dishes were pretreated with medium or R406 (3 μM) for 30 min and further incubated with TNFα (50 ng/ml) for 60 min. Cells were then washed with ice-cold phosphate-buffered saline, and nuclear extracts were prepared as described previously (Han et al., 2001). A nuclear extraction kit (Chemicon International, Temecula, CA) was used to isolate extracts, and AP-1 EMSA was performed using a gel shift assay system kit (Promega, Madison, WI) with nonradioactive competition oligonucleotides to demonstrate specificity. The protein concentration was determined, and lane loading was normalized appropriately. The nuclear extract was mixed with the appropriate purified γ-32P-labeled oligonucleotides, resolved by 6% polyacrylamide gel electrophoresis, dried, and visualized by autoradiography. Quantitative Real-Time Polymerase Chain Reaction. RA FLS were cultured in DMEM with 0.1% FCS in six-well plates for 48 h and treated with medium or different concentrations of R406 for 30 min. Cells were then stimulated with medium or TNFα (50 ng/ml) for 6 h. Cells were then harvested, and cDNA was prepared as described previously (Boyle et al., 2003). Quantitative real-time polymerase chain reaction (PCR) was performed to determine relative mRNA levels using the GeneAmp 5700 Sequence Detection System (Applied Biosystems, Foster City, CA). Predeveloped sequence detection reagents specific for human IL-6, MMP-3, and GAPDH (Applied Biosystems) were used. PCR was performed with TaqMan Universal PCR Master Mix by using the following protocol: initial activation of AmpliTaq Gold DNA polymerase at 95°C for 10 min, and 40 cycles of 95°C for 15 s and 60°C for 1 min. The fluorescent signal was plotted versus cycle number, and the cycle threshold (Ct) was determined. The standard curve method was used to determine relative gene expression as described previously (Boyle et al., 2003). The data were normalized to GAPDH to calculate the relative cell equivalents (Boyle et al., 2003). Each PCR run also included nontemplate controls containing all reagents except cDNA. These controls generated a Ct greater than 40 in all experiments. Enzyme-Linked Immunosorbent Assay (ELISA). RA FLS (2 × 105 cells/well) were cultured in DMEM with 0.1% FCS in six-well plates for 48 h and treated with medium or different concentrations of R406 for 30 min. Cells were then stimulated with medium or TNFα (50 ng/ml) for 18 h. The supernatants were harvested and assayed for IL-6 and MMP-3 by ELISA per the manufacturer's instructions (R&D Systems). Statistical Analysis. Data are expressed as mean ± S.E.M. Statistics were performed by paired or unpaired Student's t test. P values less than 0.05 were considered significant. Expression and Activation of Syk in RA ST and FLS. Initial studies were performed to determine whether Syk is expressed in RA using immunohistochemistry. As shown in a representative section (Fig. 2A), Syk protein was detected in RA synovium, especially in the intimal lining (n = 5). Syk was also detected in OA synovium in a similar pattern as in RA synovium (n = 2, data not shown). To confirm Syk protein expression in RA ST compared with OA or normal ST, Western blot analysis was performed on synovial tissue lysates (Fig. 2B). Although there was a trend of increased expression of total Syk protein in RA STs, the amount of total Syk protein was not significantly different among these three groups. However, the level of phosphorylated Syk protein expression was significantly higher in RA ST compared with OA samples. Because Syk protein is primarily expressed in intimal lining cells, we next evaluated the expression and activation of Syk in cultured RA FLS. Syk protein was detected in RA FLS as shown in Fig. 3A. To explore the time course of Syk activation by TNFα, FLS were stimulated with 50 ng/ml TNFα for 30 s to 15 min. In vitro kinase assays using immunoprecipitated Syk and LATs as the substrate showed Syk activation after stimulation with TNFα within 30 s that continued to increase for at least 15 min, with an 8.5 ± 4.1-fold increase over control (Fig. 3B). Preincubation of FLS with Syk kinase inhibitor R406 (3 μM) before TNFα stimulation decreased kinase function by 68 ± 13% after 15 min of TNFα stimulation and 46 ± 7% after 30 min (Fig. 3C). Inhibition of Syk kinase activation was also observed when R406 was added directly to the kinase reaction. 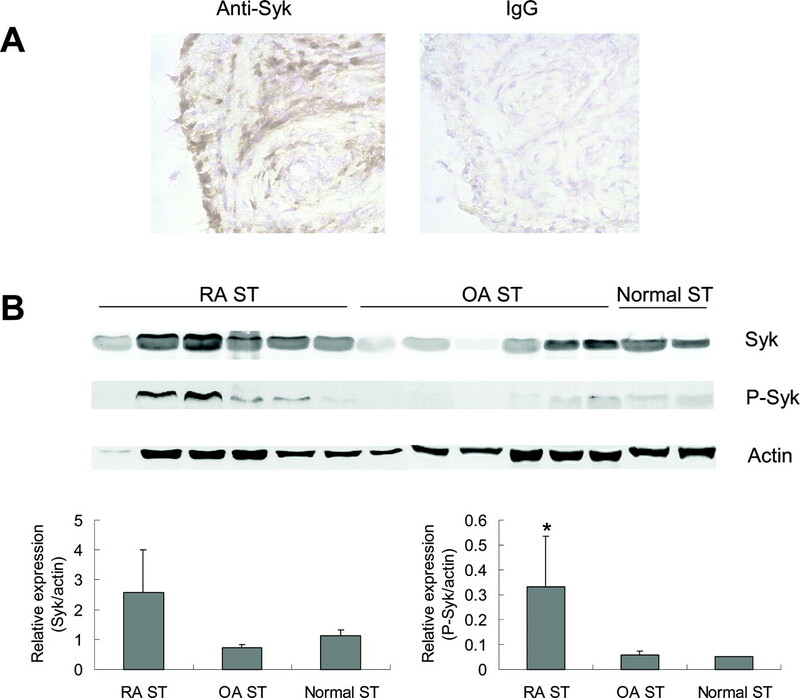 Syk protein expression in RA ST. A, a representative example of immunohistochemistry to detect Syk is shown for RA STs. Syk was detected in RA synovium, especially in the synovial lining. A serial section with an isotype-matched control antibody (IgG) was negative. B, total proteins from RA (n = 6), OA (n = 6), and normal (n = 2) STs were extracted, and Western blot analysis was performed using specific antibodies to detect Syk, phosphorylated Syk, and β-actin expression. RA STs expressed significantly higher phosphorylated Syk expression compared with OA STs when normalized with the β-actin expression level. *, p < 0.05 for RA ST compared with OA ST. Data are shown as the ratio of arbitrary absorption units for Syk or phospho-Syk to actin. Expression and activation of Syk protein kinase in RA FLS. A, total proteins from RA FLS lysates were subjected for immunoblot using Syk-specific monoclonal antibody (n = 6). Syk protein expression was observed as a 72-kDa-size band. B, RA FLS were treated with 50 ng/ml TNFα for the indicated times, and total proteins were extracted and immunoprecipitated with antibody to Syk. The ability of the immunoprecipitates to phosphorylate GST-LAT was determined by in vitro kinase assays. TNFα increased Syk kinase activity in a time-dependent manner (n = 4, p < 0.05). C, RA FLS were preincubated with medium or R406 (3 μM) for 30 min, and then cells were treated with TNFα (50 ng/ml) for the indicated time. Pretreatment of R406 inhibited GST-LAT phosphorylation (n = 3, p < 0.05 for both time points). Note the inhibition of GST-LAT phosphorylation after 30 min of TNFα treatment by the addition of R406 (3 μM) directly to kinase reaction. Effect of R406 on the Phosphorylation of JNK, p38, and ERK. Because TNFα is a potent activator of MAPKs, we next performed Western blot analysis to determine the effect of Syk inhibition on MAPK activation. RA FLS were synchronized in 0.1% FCS for 48 h and then treated with medium or 3 μM R406. Thirty minutes later, cells were stimulated with 50 ng/ml TNFα for 5 to 30 min. Cell lysates were subjected to immunoblotting with antibodies specific for phosphorylated MAPK or total MAPK. As shown in Fig. 4A, R406 markedly decreased TNFα-induced JNK phosphorylation. ERK activation was also modestly decreased by R406. Figure 4B shows a dose response for R406, indicating that 1 μM suppresses JNK phosphorylation. However, p38 phosphorylation by TNFα stimulation was not affected by R406 pretreatment. Similar results were obtained using another Syk inhibitor, piceatannol. Figure 5 shows that piceatannol inhibited TNFα-induced JNK and, to a lesser extent, ERK phosphorylation. p38 phosphorylation was not affected by piceatannol even at the highest concentration (20 μM). Because Syk inhibition mainly suppressed JNK activation but not p38 activation, we investigated the effect of R406 on the activation of the upstream MAPK kinases MKK4 and MKK3/6, which activate JNK and p38, respectively. As shown in Fig. 6, MKK4 phosphorylation peaked at 5 min after TNFα stimulation, and this was blocked by 3 μM R406 pretreatment. MKK3/6 phosphorylation induced by TNFα was not affected by R406. Effect of R406 on c-Jun and AP-1 Activation. To evaluate the functional relevance of Syk-mediated JNK activation, the effect of Syk inhibition on the JNK substrate c-Jun was evaluated. 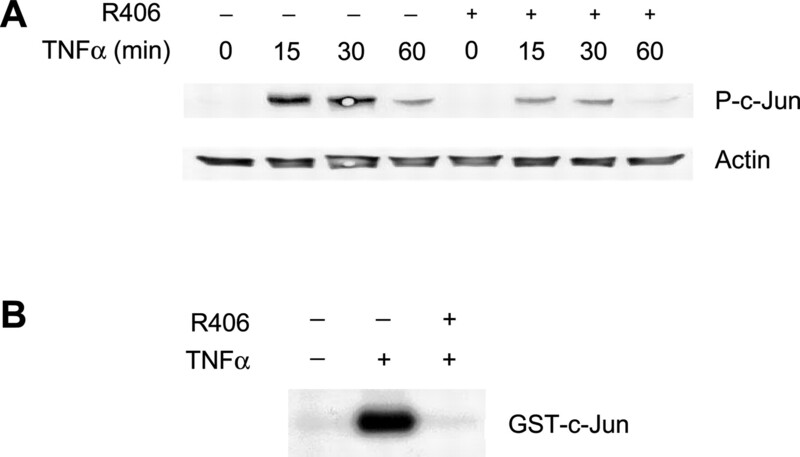 Western blot analysis showed significant suppression of TNFα-induced phosphorylated c-Jun protein expression by R406 (Fig. 7A). To determine whether R406 inhibits the functional activation of JNK, in vitro kinase assays were then performed using GST-c-Jun as the substrate. As shown in Fig. 7B, R406 completely inhibited JNK kinase function in TNFα-stimulated FLS. Because AP-1 is the major transcription factor activated by JNK, and blockade of Syk inhibited the JNK pathway, we next investigated the effect of Syk inhibition on AP-1. As shown in Fig. 8, TNFα-induced AP-1 binding was significantly decreased by R406 in RA FLS. Effect of R406 on TNFα-induced MAPKs phosphorylation. A, cultured RA FLS were treated with medium or R406 (3 μM) for 30 min and then stimulated with TNFα (50 ng/ml) for 5 to 30 min. Total proteins were extracted and evaluated by Western blot analysis. Representative blot of independent experiments is shown (n = 3). Note the decrease of phospho-JNK and the modest decrease of phospho-ERK expression by R406. Total MAPK-normalized phospho-MAPK levels show 75 ± 9% inhibition of JNK (**, p < 0.01), 54 ± 7% inhibition of ERK1 (*, p < 0.05) and 35 ± 6% inhibition of ERK2 (p > 0.10) phosphorylation by R406 after 15 min of TNFα stimulation. However, p38 phosphorylation was not inhibited by R406 treatment. Data are shown as the ratio of arbitrary absorption units for the phosphorylated MAPK to total MAPK (e.g., phospho-JNK/JNK). B, RA FLS were cultured to 90% confluence, serum-starved for 36 h, and pretreated with varying concentrations of R406 for 30 min. FLS were then stimulated with 50 ng/ml TNFα for 15 min and then analyzed by Western blot for JNK and phospho-JNK expression. Effect of piceatannol on TNFα-induced MAPK phosphorylation. RA FLS were treated with piceatannol (0, 5, 10, and 20 μM) for 1 h and then stimulated with TNFα (50 ng/ml) for 15 min. Total protein was extracted and evaluated by Western blot analysis. Blot shown is a representative example from two independent experiments with similar results. Whereas phospho-JNK and phospho-ERK were decreased by piceatannol, p38 phosphorylation induced by TNFα was unaffected. 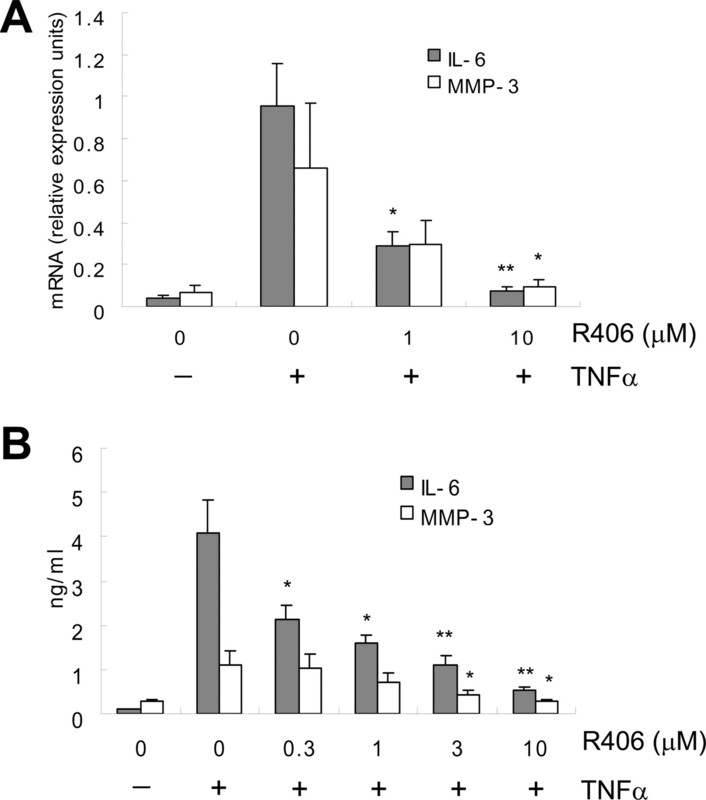 Effect of R406 on TNFα-Induced IL-6 and MMP-3 Production in FLS. IL-6 and MMP-3 have been implicated in the pathogenesis of RA and are produced by FLS in situ. Both of these genes contain AP-1 binding sites in their promoter regions and are regulated by JNK (Firestein, 2003; de Haij et al., 2005). Therefore, we investigated whether inhibiting Syk activity by R406 influences expression of these genes in TNFα-stimulated RA FLS. As shown in Fig. 9A, R406 significantly decreased IL-6 and MMP-3 mRNA expression in a dose-dependent manner. IL-6 and MMP-3 protein release after TNFα stimulation also showed a dose-dependent decrease when the cells were treated with R406 (Fig. 9B). The dose response for mediator production was similar to the one for JNK phosphorylation (Fig. 4B). Inhibition of MKK4 activation by R406. RA FLS were treated with medium or R406 (3 μM) for 30 min and then stimulated with TNFα (50 ng/ml) for 5 to 30 min. Total proteins were extracted and evaluated by Western blot analysis. This is representative of two independent experiments with similar results. Note the marked decrease of phospho-MKK4 by R406 after 5 min of TNFα stimulation. Phosphorylation of MKK3/6 was not significantly changed by R406. Rheumatoid arthritis is an immune-mediated disease marked by synovial intimal hyperplasia and sublining infiltration of a variety of mononuclear cells. The pathogenesis is quite complex but involves production of inflammatory mediators such as cytokines and MMPs that recruit cells to the joint and alter the extracellular matrix. Understanding the intracellular machinery that regulates gene expression in RA synovium, including the signal transduction pathways, have led to novel therapeutic interventions. Based on this concept and data suggesting that Syk might play a role in autoimmune and inflammatory disease, we investigated the role of this kinase in RA. Western blot studies demonstrated that Syk is phosphorylated in RA synovium and that it could be activated in cultured FLS by TNFα. Using a novel Syk inhibitor, R406, we demonstrated that Syk plays a crucial role in TNFα-induced JNK activation and proinflammatory gene expression in synoviocytes. Hence, Syk represents a potential therapeutic target for inflammatory synovitis. Inhibition of TNFα-induced c-Jun activation by R406. A, RA FLS were treated with medium or R406 (3 μM) for 30 min and then stimulated with TNFα (50 ng/ml) for 15 to 60 min. Total proteins were extracted and evaluated by Western blot analysis. TNFα-induced phospho-c-Jun expression was significantly decreased by R406 after 30 min of TNFα stimulation (n = 3, 78 ± 9% inhibition, p < 0.05). B, RA FLS were treated with medium or R406 (3 μM) for 30 min, and then cells were stimulated with TNFα (50 ng/ml) for 15 min. Total proteins were extracted and immunoprecipitated with monoclonal antibody to JNK. The ability of the immunoprecipitates to phosphorylate GST-c-Jun was determined by in vitro kinase assays. Representative results from two independent experiments are shown. Note the complete inhibition of JNK kinase function by R406. Inhibition of TNFα-induced AP-1 activation by R406. Cultured FLS were treated with medium or R406 (3 μM) for 30 min and then stimulated with TNFα (50 ng/ml) for 1 h. Nuclear extracts were prepared and assayed for AP-1 activation by EMSA (n = 4, one representative experiment is shown). R406 significantly decreased AP-1 binding in TNFα-stimulated FLS (74 ± 13% inhibition, p < 0.05). 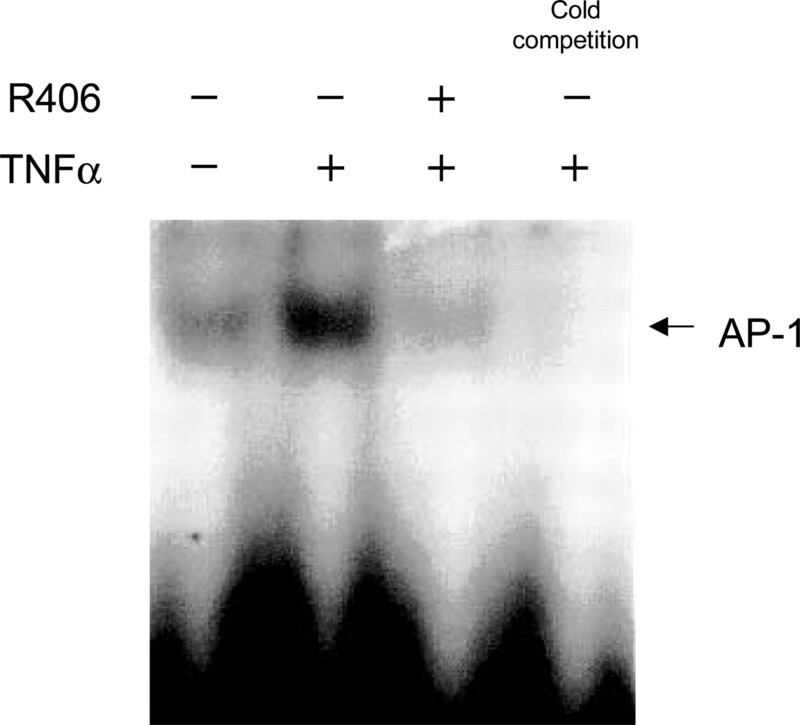 Nonradioactive competition confirms the specificity of the band for AP-1 binding. The normal functions of Syk in homeostasis and host defense vary considerably depending on the specific cell lineages and stimuli. In mast cells and basophils, it is necessary for degranulation, synthesis of leukotrienes, and cytokines secretion upon FcϵR1 engagement (Costello et al., 1996; Zhang et al., 1996). Syk–/– macrophages and neutrophils have defective reactive oxygen intermediate generation and phagocytosis in response to integrin or FcγR engagement (Mocsai et al., 2002). Syk-deficient dendritic cells fail to internalize antigens, mature, or efficiently stimulate T cells after exposure to immune complexes (Sedlik et al., 2003). Syk mutations impair the differentiation of B lymphocytes by disrupting signaling from the pre-BCR complex and thereby preventing the clonal expansion of pre-B cells (Cheng et al., 1995). The kinase has also been implicated in osteoclastogenesis (Mocsai et al., 2004). Inhibition of TNFα-induced IL-6 and MMP-3 expression by R406. A, RA FLS were treated with R406 (0, 1, and 10 μM) for 30 min, and then cells were stimulated with medium or TNFα (50 ng/ml) for 6 h. Total RNA was extracted, and quantitative real-time PCR was performed to measure IL-6 and MMP-3 mRNA expression (n = 4). Data are mRNA level normalized by GAPDH mRNA expression and expressed as relative expression units. Dose-dependent decreases of IL-6 and MMP-3 mRNA expression by R406 were observed. B, cultured FLS were treated with various concentration of R406 (0, 0.3, 1, 3, and 10 μM) for 30 min and then stimulated with medium or TNFα (50 ng/ml) for 18 h. Culture supernatants were collected, and the protein level of IL-6 and MMP-3 was measured by ELISA (n = 4). R406 inhibited TNFα-induced IL-6 and MMP-3 protein expression in a dose-dependent manner. *, p < 0.05; **, p < 0.01 compared with TNFα stimulation without R406 pretreatment. The experiments described in this report suggest that Syk regulates the MAPK cascade in FLS, with especially prominent effects on the JNK pathway. Syk blockade resulted in marked inhibition of TNFα-induced JNK phosphorylation, and the functional activation of JNK kinase was almost completely blocked. JNK inhibition was not likely the result of direct action of the compound on JNK because phosphorylation of the upstream MAPK kinase MKK4 was also decreased. This suggests that Syk feeds into the JNK pathway proximal to the MAPK kinases, which are regulated by a complex and inter-related group of MAPK kinase kinases. Syk might also directly interact with TNF receptor in Jurkat cells by showing that TNFα could induce the recruitment of Syk protein in the TNF receptor complex (Takada and Aggarwal, 2004). The functional relevance of JNK inhibition in FLS was confirmed by demonstrating downstream effects on c-Jun phosphorylation, AP-1 activation, and expression of JNK-regulated genes such as IL-6 and MMP-3. Although the effect of R406 is likely mediated through selective inhibition of Syk, it is possible that the compound also affects other kinases. For instance, the compound can potentially inhibit kinases closely related to Syk, such as Lck, c-Kit, and Flt3. The pharmacology of R406 in intact cells, however, differs from its effects on isolated enzymes. Although the mechanism is not certain, selectivity for Syk increases in cell-based assays and supports the notion that Syk is the actual target. The fact that a second Syk inhibitor, piceatannol, has very similar effects on the MAPKs supports this concept. In contrast to JNK, little or no effect of Syk was observed on the p38 pathway in cultured FLS, suggesting that the Syk interaction with MAPKs is highly specific. Syk contributed only partially for ERK activation. These results contrast with studies in Jurkat cells, where piceatannol completely suppressed TNFα-induced activation of all three MAPKs (Takada and Aggarwal, 2004). A recent study in neutrophils, however, shows that piceatannol decreases lipopolysaccharide-induced JNK activation without affecting p38 (Arndt et al., 2004). Reduced Syk expression by antisense oligonucleotides in nasal fibroblast lines also completely inhibited IL-1-induced JNK phosphorylation with only partial attenuation of p38 phosphorylation (Yamada et al., 2001). The importance of Syk in TNFα-induced JNK activation was also highlighted in another study in which they showed that piceatannol pretreatment induced a concentration-dependent inhibition of JNK1 activation in TNFα-stimulated neutrophils (Avdi et al., 2001). The ability of Syk inhibition to regulate these key mediators and pathways in FLS and other cell lineages suggest targeting Syk may be useful in the treatment RA. Because Syk participates in signal transduction in FLS and many other cell types implicated in this disease, Syk inhibition is a potentially attractive therapeutic target. Concerns regarding the risks of Syk blockade still must be addressed, especially related to host defense in light of the number of cells and pathways that will be affected. Homozygous disruption of the syk gene in mice results in severe hemorrhage and perinatal death (Cheng et al., 1995). However, recent data suggest that bleeding observed in Syk-deficient mice is due to a developmental defect of the vasculature and not because of platelet or endothelial cell dysfunction (Abtahian et al., 2003). In a recently performed phase II double-blind, randomized, placebo-controlled study in seasonal allergic rhinitis patients, intranasal administration of a Syk inhibitor showed efficacy without increased adverse events (Meltzer et al., 2005). However, the trial used short-term topical treatment, and thus it may be difficult to predict the long-term risks of systemic therapy. In conclusion, these data demonstrate that Syk is expressed and activated in RA synovium and serves as a key regulator in TNFα-induced IL-6 and MMP-3 production in RA FLS. The mechanism of action for cytokine and MMP suppression probably involves the MAPK cascade, especially JNK. The novel Syk inhibitor R406 would have benefits in the treatment of RA by preventing the production of these proinflammatory cytokine and MMP from FLS. We thank Rajinder Singh for providing R406 and Esteban Masuda for providing information on the biology and biochemistry of R406. These studies were supported by a grant from Rigel Pharmaceuticals. G.S.F. is a consultant for Rigel Pharmaceuticals. ABBREVIATIONS: RA, rheumatoid arthritis; FLS, fibroblast-like synoviocyte(s); IL, interleukin; MAPK, mitogen-activated protein kinase; AP-1, activator protein 1; NF-κB, nuclear factor κB; Syk, spleen tyrosine kinase; FcR, Fc receptor; BCR, B cell receptor; TNFα, tumor necrosis factor-α; R406, N4-(2,2-dimethyl-3-oxo-4H-pyrid[1,4]oxazin-6-yl)-5-fluoro-N2-(3,4,5-trimethoxyphenyl)-2,4-pyrimidinediamine; LAT, linker for activation of T cells; JAK, Janus tyrosine kinase; STAT, signal transducer and activator of transcription; ERK, extracellular signal-regulated kinase; JNK, c-Jun N-terminal kinase; ST, synovial tissue; OA, osteoarthritis; DMEM, Dulbecco's modified Eagle's medium; FCS, fetal calf serum; MKK, mitogen-activated protein kinase kinase; GST, glutathione S-transferase; MMP, matrix metalloproteinase; EMSA, electrophoretic mobility shift assay; PCR, polymerase chain reaction; GAPDH, glyceraldehyde-3-phosphate dehydrogenase; MMP, matrix metalloproteinase; ELISA, enzyme-linked immunosorbent assay. ↵1 Current affiliation: Department of Medicine, Samsung Medical Center, Sungkyunkwan University School of Medicine, Seoul, Korea. Abtahian F, Guerriero A, Sebzda E, Lu MM, Zhou R, Mocsai A, Myers EE, Huang B, Jackson DG, Ferrari VA, et al. (2003) Regulation of blood and lymphatic vascular separation by signaling proteins SLP-76 and Syk. Science (Wash DC) 299: 247–251. Alvaro-Gracia JM, Zvaifler NJ, Brown CB, Kaushansky K, and Firestein GS (1991) Cytokines in chronic inflammatory arthritis. VI. Analysis of the synovial cells involved in granulocyte-macrophage colony-stimulating factor production and gene expression in rheumatoid arthritis and its regulation by IL-1 and tumor necrosis factor-alpha. J Immunol 146: 3365–3371. Arndt PG, Suzuki N, Avdi NJ, Malcolm KC, and Worthen GS (2004) Lipopolysaccharide-induced c-Jun NH2-terminal kinase activation in human neutrophils: role of phosphatidylinositol 3-kinase and Syk-mediated pathways. J Biol Chem 279: 10883–10891. Arnett FC, Edworthy SM, Bloch DA, McShane DJ, Fries JF, Cooper NS, Healey LA, Kaplan SR, Liang MH, Luthra HS, et al. (1988) The American Rheumatism Association 1987 revised criteria for the classification of rheumatoid arthritis. Arthritis Rheum 31: 315–324. Avdi NJ, Nick JA, Whitlock BB, Billstrom MA, Henson PM, Johnson GL, and Worthen GS (2001) Tumor necrosis factor-α activation of the c-Jun N-terminal kinase pathway in human neutrophils. Integrin involvement in a pathway leading from cytoplasmic tyrosine kinases apoptosis. J Biol Chem 276: 2189–2199. Boyle DL, Rosengren S, Bugbee W, Kavanaugh A, and Firestein GS (2003) Quantitative biomarker analysis of synovial gene expression by real-time PCR. Arthritis Res Ther 5: R352–R560. Cheng AM, Rowley B, Pao W, Hayday A, Bolen JB, and Pawson T (1995) Syk tyrosine kinase required for mouse viability and B-cell development. Nature (Lond) 378: 303–306. Coopman PJ, Do MT, Barth M, Bowden ET, Hayes AJ, Basyuk E, Blancato JK, Vezza PR, McLeskey SW, Mangeat PH, et al. (2000) The Syk tyrosine kinase suppresses malignant growth of human breast cancer cells. Nature (Lond) 406: 742–747. Costello PS, Turner M, Walters AE, Cunningham CN, Bauer PH, Downward J, and Tybulewicz VL (1996) Critical role for the tyrosine kinase Syk in signalling through the high affinity IgE receptor of mast cells. Oncogene 13: 2595–2605. de Haij S, Bakker AC, van der Geest RN, Haegeman G, Vanden Berghe W, Aarbiou J, Daha MR, and van Kooten C (2005) NF-κB mediated IL-6 production by renal epithelial cells is regulated by c-jun NH2-terminal kinase. J Am Soc Nephrol 16: 1603–1611. Elices MJ, Tsai V, Strahl D, Goel AS, Tollefson V, Arrhenius T, Wayner EA, Gaeta FC, Fikes JD, and Firestein GS (1994) Expression and functional significance of alternatively spliced CS1 fibronectin in rheumatoid arthritis microvasculature. J Clin Investig 93: 405–416. Firestein GS (2003) Evolving concepts of rheumatoid arthritis. Nature (Lond) 423: 356–361. Hammaker DR, Boyle DL, Chabaud-Riou M, and Firestein GS (2004) Regulation of c-Jun N-terminal kinase by MEKK-2 and mitogen-activated protein kinase kinase kinases in rheumatoid arthritis. J Immunol 172: 1612–1618. Han Z, Boyle DL, Chang L, Bennett B, Karin M, Yang L, Manning AM, and Firestein GS (2001) c-Jun N-terminal kinase is required for metalloproteinase expression and joint destruction in inflammatory arthritis. J Clin Investig 108: 73–81. Matsubara S, Li G, Takeda K, Loader JE, Pine P, Masuda ES, Miyahara N, Miyahara S, Lucas JJ, Dakhama A, et al. (2006) Inhibition of spleen tyrosine kinase prevents mast cell activation and airway hyperresponsiveness. Am J Respir Crit Care Med 173: 56–63. Meltzer EO, Berkowitz RB, and Grossbard EB (2005) An intranasal Syk-kinase inhibitor (R112) improves the symptoms of seasonal allergic rhinitis in a park environment. J Allergy Clin Immunol 115: 791–796. Mocsai A, Humphrey MB, Van Ziffle JA, Hu Y, Burghardt A, Spusta SC, Majumdar S, Lanier LL, Lowell CA, and Nakamura MC (2004) The immunomodulatory adapter proteins DAP12 and Fc receptor γ-chain (FcRγ) regulate development of functional osteoclasts through the Syk tyrosine kinase. Proc Natl Acad Sci USA 101: 6158–6163. Mocsai A, Zhou M, Meng F, Tybulewicz VL, and Lowell CA (2002) Syk is required for integrin signaling in neutrophils. Immunity 16: 547–558. Okamura S, Ng CC, Koyama K, Takei Y, Arakawa H, Monden M, and Nakamura Y (1999) Identification of seven genes regulated by wild-type p53 in a colon cancer cell line carrying a well-controlled wild-type p53 expression system. Oncol Res 11: 281–285. Raeder EM, Mansfield PJ, Hinkovska-Galcheva V, Shayman JA, and Boxer LA (1999) Syk activation initiates downstream signaling events during human polymorphonuclear leukocyte phagocytosis. J Immunol 163: 6785–6793. Sedlik C, Orbach D, Veron P, Schweighoffer E, Colucci F, Gamberale R, Ioan-Facsinay A, Verbeek S, Ricciardi-Castagnoli P, Bonnerot C, et al. (2003) A critical role for Syk protein tyrosine kinase in Fc receptor-mediated antigen presentation and induction of dendritic cell maturation. J Immunol 170: 846–852. Sundarrajan M, Boyle DL, Chabaud-Riou M, Hammaker D, and Firestein GS (2003) Expression of the MAPK kinases MKK-4 and MKK-7 in rheumatoid arthritis and their role as key regulators of JNK. Arthritis Rheum 48: 2450–2460. Sweeney SE and Firestein GS (2004) Signal transduction in rheumatoid arthritis. Curr Opin Rheumatol 16: 231–237. Takada Y and Aggarwal BB (2004) TNF activates Syk protein tyrosine kinase leading to TNF-induced MAPK activation, NF-κB activation and apoptosis. J Immunol 173: 1066–1077. Taylor VC, Herlaar E, Huynh S, Braselmann S, Zhao H, et al. (2005) R406, a potent and selective Syk kinase inhibitor for the treatment of rheumatoid arthritis, in FASEB Autoimmunity Conference; 11–16 June 2005; Saxtons River, VT. Abstract 39. Tsuchida S, Yanagi S, Inatome R, Ding J, Hermann P, Tsujimura T, Matsui N, and Yamamura H (2000) Purification of a 72-kDa protein-tyrosine kinase from rat liver and its identification as Syk: involvement of Syk in signaling events of hepatocytes. J Biochem (Tokyo) 127: 321–327. Tsujimura T, Yanagi S, Inatome R, Takano T, Ishihara I, Mitsui N, Takahashi S, and Yamamura H (2001) Syk protein-tyrosine kinase is involved in neuron-like differentiation of embryonal carcinoma P19 cells. FEBS Lett 489: 129–133. Ulanova M, Puttagunta L, Marcet-Palacios M, Duszyk M, Steinhoff U, Duta F, Kim MK, Indik ZK, Schreiber AD, and Befus AD (2005) Syk tyrosine kinase participates in β1-integrin signaling and inflammatory responses in airway epithelial cells. Am J Physiol 288: L497–L507. Wong BR, Grossbard EB, Payan DG, and Masuda ES (2004) Targeting Syk as a treatment for allergic and autoimmune disorders. Expert Opin Investig Drugs 13: 743–762. Yamada T, Fujieda S, Yanagi S, Yamamura H, Inatome R, Yamamoto H, Igawa H, and Saito H (2001) IL-1 induced chemokine production through the association of Syk with TNF receptor-associated factor-6 in nasal fibroblast lines. J Immunol 167: 283–288. Yanagi S, Inatome R, Ding J, Kitaguchi H, Tybulewicz VL, and Yamamura H (2001) Syk expression in endothelial cells and their morphologic defects in embryonic Syk-deficient mice. Blood 98: 2869–2871. Zhang J, Berenstein EH, Evans RL, and Siraganian RP (1996) Transfection of Syk protein tyrosine kinase reconstitutes high affinity IgE receptor-mediated degranulation in a Syk-negative variant of rat basophilic leukemia RBL-2H3 cells. J Exp Med 184: 71–79. Zhang J and Siraganian RP (1999) CD45 is essential for FcϵRI signaling by ZAP70, but not Syk, in Syk-negative mast cells. J Immunol 163: 2508–2516.